The former Nick Arcade announcer talks about the show and the mysterious enthlevel project. You have a lot going on because your announcement is… tomorrow? Yes, Tuesday, and I get to find out with everyone else. I’m kept in the dark about this. Oh, this is exciting. We’re all aflutter with what exactly this could be. Out of the blue, I get a call a few weeks ago from James Bethea, the co-creator of Nick Arcade, and he and the other co-creator, Karim Miteff, have gotten together and they are wanting to do this new game show that is going to be—not necessarily, it’s not a reboot of Nick Arcade. It’s kind of what Nick Arcade was all about, but harnessing 21st century technology. They’re going to take it to the enthlevel. Ahhhh. I see what they did there. So, coming from someone who was that target market, a 10-year-old in the mid-90s, to me, Nick Arcade was this celebration of video games. It was video games from top to bottom. You played a video game, and then there was a game in the middle and then in the middle of that game, there were MORE video games, and then at the end, you went INTO a video game. For me, it was this giant celebration of video games. I’m wondering what exactly [Bethea and Miteff’s] vision was for Nick Arcade? I think Nick Arcade, back then, it was like, “Oh, this is really cool, it’s gonna be green-screen, like the weathermen and the sportsmen,” but then you get on this enormous set, and you go, “Oh my gosh, this is hard!” It’s like, I’m being beat up by 8-year-olds! I was in my late 20s, something like that, back then, in great shape, and I was going, “this is really, really hard.” So, it was really cool to be inside a video game. 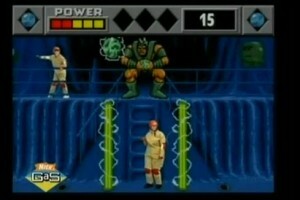 So you actually got to run the gamut through the final round and do the green screen challenges? Oh yeah, oh yeah. And I was not successful with Scorchia or Mongo, if you remember those childhood things. Oh, absolutely. Mongo was my favorite. If ever I could convince my parents to go to Florida to try to get on Nick Arcade, which NEVER HAPPENED, DAD, I was hoping to face Mongo. But you know, these things happen. It was awfully cool. It was an electric energy on the set. Phil Moore was [whirring noise] and all of us—it was a group of really rare individuals working on this cool, innovative production. 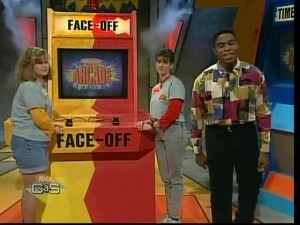 Going back to the original production, you were the announcer for Nick Arcade. What were your day-to-day roles during production? Well, we got the scripts. The scripts were zany. I was, of course, never on camera, which was really cool because when we were taping, I was right in front of the [in announcer cadence] Live Studio Audience [normal] but the cameras were never on me. That was kinda cool that I could just be this voice for this show. We’d get the script, the show would start the same every time: “Geeeeet ready for the ultimate video challenge!” And then, when we got to the part where I threw it to Phil, it was always something zany and silly. Because we were taping live, we never knew where the contestants were going to take Mikey—up, down, diagonally, whatever direction on the board. Depending on what they did, we had to be ready. If they landed on something and it was a prize, I had to be ready with a live prize read. Or, if they landed on a face-off or something like that, and that had to be brought up. Or, if they landed on one of the videos, the guy in that department had to have that video ready to be cued. It was a very, very busy half hour. When we were shooting these, we shot four episodes a day. It was a very fast-paced, long day. I know that shows like Jeopardy! and Wheel of Fortune are almost purely live-to-tape. I’m sure working with kids is a little different, because even adults aren’t trained to be under lights and playing games under that pressure. On an average taping day, how smooth did everything run? We were live-to-tape and never stopped. It went live-to-tape—I don’t think we had any production delays. If we couldn’t do, let’s say, the bonus round, or we reset to that, it went pretty quickly. The front part of the show into the bonus round, there was a very quick turn-around to reset the set. You’re also asking stuff from over 20 years ago, and I’m thinking, “Yeah, I think that’s how it happened!” It was a long time ago! We never had to stop tape, no one threw a tantrum. Everyone did their job and none of us were perfect, but we tried to do a great a job as we were able to do. I’m just going through questions that I had as a child. You’re a 30-some year old man, I’m sure. I did the math. It’s been over 20 years. That’s about right. I know some of the games that were played were actually, like, they weren’t done. Sonic 2 was on Nick Arcade and it wasn’t released yet. What kind of relationship did the producing crew have with the video game companies providing these games? That is more of a question for the creators, because Karim and James worked their magic to get things like Sonic, as you remember, on these shows as a promotional arrangement. I don’t know what they did, but it is very key for Nick Arcade, as will be for enthlevel, to have a union with video game makers. I’ll say that. I know that much about it. It’s vitally important to have a relationship, kind of one hand scratches the others’ back, so to speak. I don’t know how they did it, but it was very new technology. Talking with James Bethea, he was telling me just recently that even pitching the show to Nickelodeon was like, “OK, we get it, but we need to see it. We get it on paper, but what are you going to do with the technology?” And they had to shoot a pilot to show them what was going to be created. Something that new—now, 20 years later, fast forward, you think about what we’re like with our smartphones and messaging, it’s amazing what has happened with the advancement of technology. But back then, were were like, “What do you mean, you go inside a video game?” So I think it was all new and that’s what made it groundbreaking and fun. I mean, that was Nickelodeon’s hey-day. They were willing to take risks and do things. What we’ve got coming up with enthlevel, out of the blue, a few weeks ago, I was called and said, “Hey, we’ve got this thing we’ve like to do,” and I’m like, “What?” So, it’s really cool that all these years later, Phil Moore, the host, and the creators and—you know, basically, Phil and I WERE the cast, besides the contestants. The contestants were the most important people of the show. We’re going to come back and do something that is in the same genre but completely new and like I said, it’s kind of like, everything we accomplished with Nick Arcade and the barriers that were broken down with Nick Arcade, and I know that’s one of the reasons they’re calling it enthlevel. 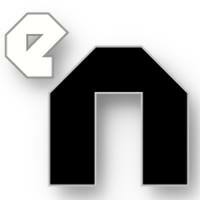 Instead of it being n-t-h, it’s e-n-t-h level because of all the electronic level of it all. It’s taking it up to what we’ve created at the enthlevel. Who is enthlevel targeted to? Is it targeted to me, who grew up with Nick Arcade and want to relive that magic, or is it targeted to kid, who don’t have Nick Arcade now? Who’s the target? [in announcer cadence] Cory, that’s a good question! As the announcer of Nick Arcade, I can tell you that—[normal] no, I’ll talk normal. Awww. From now on, just talk like the announcer from Nick Arcade! I have my new ringtone, thank you. [laughs] Alright, enthlevel, you said who it was targeted to, Cory? It’s targeted to teens, it’s targeted to adults. It’s targeted to you, it’s targeted to a 38-year old, it’s targeted to a 48-year old and it’s targeted to teens. Really, that’s the umbrella that I know about. It’s going to be live-action with CG characters. They really haven’t told me, other than what I’ve just mentioned, what’s going on. The official announcement, coming up tomorrow, is giving up a big reveal: how it’s going to be done and why it’s going to be done. This is all so fascinating, because taking the technology from the mid-90s and the amount of impressive processing, and then fast-forwarding it 20 years, and now we have Virtual Reality headsets that run off cell phones, and we have full-motion tracking that you can buy with your Xbox—I have the highest of hopes that this is going to blow our minds as it it did back then. Do you feel like that’s going to happen with just how excited the creators are to be moving this forward? Yes and yes. Number one, I wish I had Nick Arcade had a longer life than the two seasons. Back then, this was 1991-1992, Nickelodeon experimented with a lot of different shows, and different family-oriented game shows and things like that. That said, it was very unique and there’s a very large cluster of people like you that were kids when it happened. It’s funny, I have 9-year-old boy/girl twins. They had no idea what Mommy did. We looked it up on YouTube one time. They listened to me doing the open, and they were like, “OK, listen, we’re getting back to Minecraft now.” It was like, this is what I get. I feel like Rodney Dangerfield, I get no respect. It’s like, just you wait. 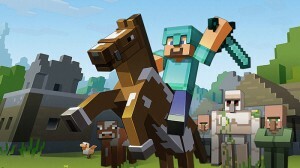 Now I can’t wait until I can go, “Aha, you think you’re so cool with Minecraft; watch Mommy do this.” So it will be really cool to see—I see what my kids grow up with and how knowledgeable they are. They teach coding in school. When I was 10, I was sitting in a dirt bed in the river. It’s just so different, and i’m not that old! Regardless of your age, this show will be geared to the kids who watched Nick Arcade, who are now in their 20s or 30s, or even sometimes teenagers, who are watching it on YouTube. I think it’ll be really, really cool. There’s that show, Are You Smarter than a Fifth Grader? It’s true, if you’ve got kids, and they’re in school, you go, “Oh, I didn’t remember that!” My fourth-grade kids are smarter than I am because I don’t remember that stuff from school. It’ll be interesting to see how a teenager in today’s world does against a 38-year-old, a 45-year-old, a 26-year-old, you know what I mean? To me, that’s very very exciting, even if I don’t understand all the components of what’s going to happen yet. I get to listen to that tomorrow and find out more about it. As we all do. I’m on the edge of my seat. [laughter] It’s something that’s like, “Alright, this is cool.” It’s Nick Arcade, but it’s not a reboot or a re-do. It’s something that takes what that show had and bringing it to the masses again. Do you know where this will be produced? Is it LA or New York…? I believe when the time comes, it will be out west, in LA. That’s the intention, but we’ll see. Were you a video game player during Nick Arcade? Back then? I couldn’t tell you any video game I played other than Donkey Kong at a bar. So you never snuck off after production shut down and grabbed Golden Axe and started going at it? OK, we played some games on the set. Basically, it wasn’t allowed. Phil and I were like two little kids, saying “Let’s go play some games,” but we just moved on. I know that sounds boring, and I wish I could give you some grandiose story, but back then, we had pagers and that’s as high tech as we got. And so is Phil Moore. Phil Moore is involved and the original creators of Nick Arcade are involved. For true Nick Arcade fans, this is something to really keep their eyes on. Yes, and it’s pretty exciting. It really is. The official enthlevel announcement will happen tomorrow, May 5. You can find out more about Enthlevel at their official website, or on their Facebook, Twitter, Instagram or YouTube pages.